Another small collection of patterns: I only have 5 of these. Anne Adams was a mail-order pattern company, and many of these patterns are from the 60s. The one on the right is my favorite of these, and it's in my size. 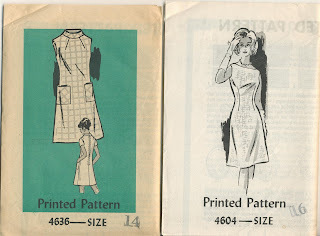 On most of the vintage patterns I wear a 14 but according to the chart on the inside of this pattern, I wear a size 16. The chart says "Standard Body Measurement Issued by the U.S. Dept. of Commerce based on Commercial Standard CS-13". Wow. Whatever that means. 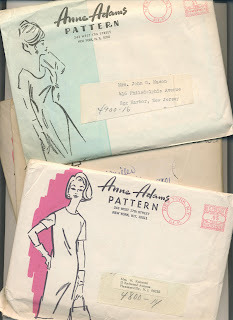 Actually, what I think it means is that all the other Anne Adams patterns I have in a size 14 won't fit me. Well, 2 out of 5 isn't bad, right? I'm not sure about that plaid number, anyway. Those pockets! Yikes! Poor placement for anyone over a size 8 anyway, if you ask me. 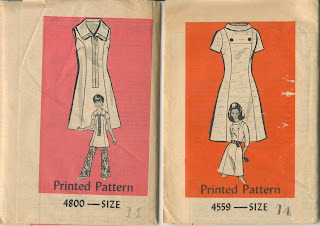 This tunic on the left sort of cracks me up. It's like a sailor costume, without the tie, plus it has that sort of groovy length. but the detail reminds me of a tennis dress. Very confusing. The dress on the right is kinda cool, maybe is some other fabric. 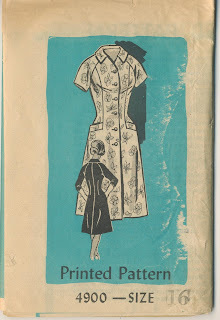 This one is in my size: a sort of bowling shirt of a dress, again, with unfortunate hip-pocket placement. I cannot have any kind of hip pocket. I just don't need any extra fabric there. 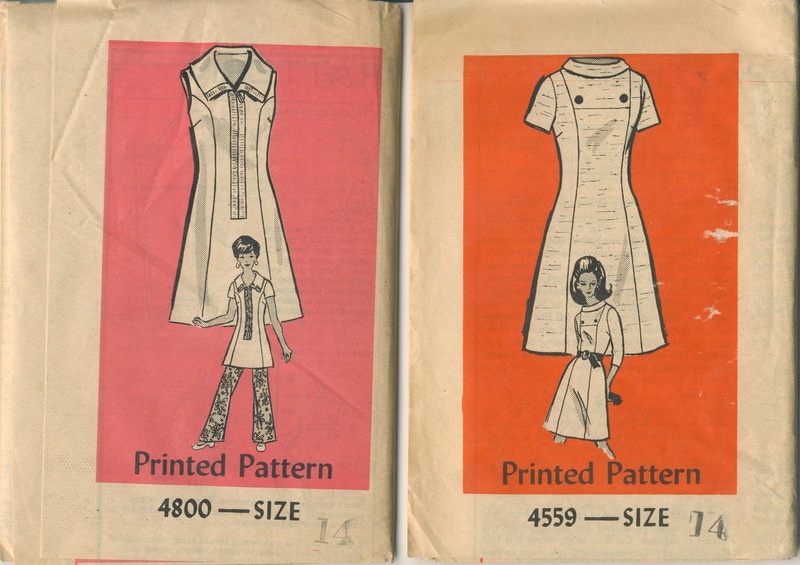 I found a couple of groups on flickr devoted to vintage patterns and boy are they ever fun to look at! I suggest doing a search there for your favorites. 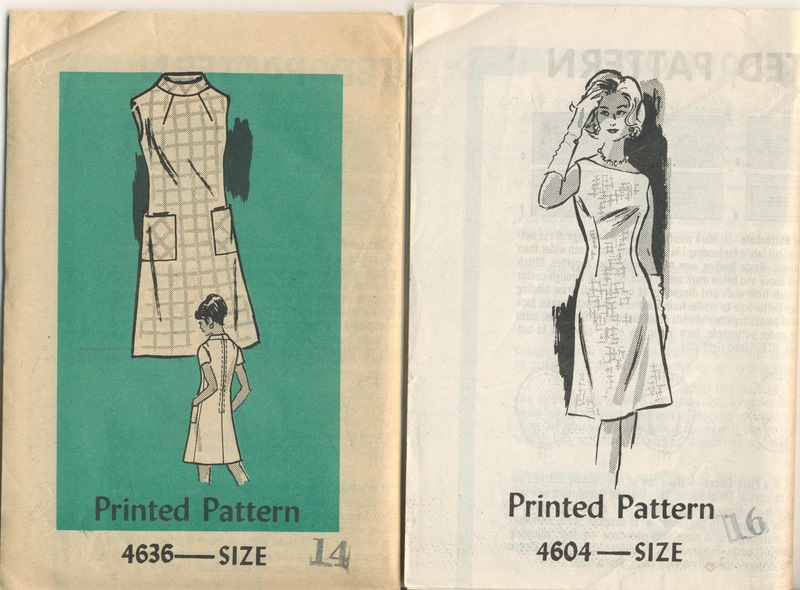 There's even a men's vintage pattern group! Lovely! 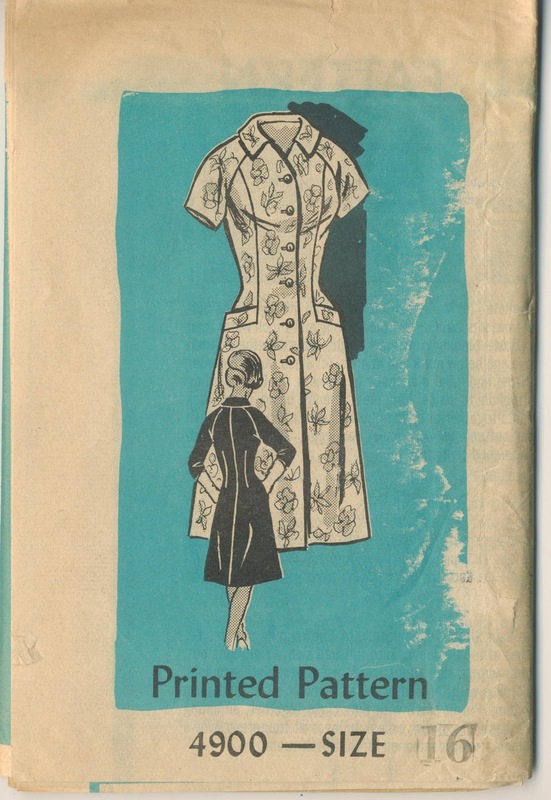 I hadn't considered until just now sharing all of my vintage patterns on flickr. What a nice way to share your collections! It's like ONLINE HOARDING!! Right up my alley! I've looked around for these online to get more info about them, like specific years, etc without much luck. I did find the confusing tunic, above, but none of the others. If you happen to see them around, let me know! I'm slowly accumulating tons of info on my patterns and it sure is fun!